From romantic sunsets, floating lanterns and lighted sparklers, a late summer wedding can be the most magical time of your life. With well-thought out preparations and considerations, wedding planning can be an enjoyable bonding experience for you as a couple. Make your end-of-summer wedding one to remember with a few tips from our team at Wedding Sparklers Outlet. Begin planning your guest list ASAP. Whether you choose to have a small intimate wedding or a large celebration for the world to see, planning your guest list months ahead of time will save you from stress and monumental headaches. You’ll be able to navigate tricky ‘plus one’ situations, map out seating charts and finalize wedding invitations in time for the big day. Remember that your wedding day is about you, so invite the ones that matter most. Wedding planning can be stressful, but that stress can be alleviated when you are able to be flexible and compromising. Always have a Plan B, just in case. If you plan on having an outdoor wedding, what will you do if the weather isn’t ideal? Will you be ready to take it indoors? What if your bridesmaids refuse to wear a certain color or style? Would you be willing to provide other options? What about when it comes to cost? Compromising can be hard, but when it comes to the small details, you shouldn’t have to sweat it. You’ll be able to discover more things about your partner and create a wedding that reflects both of your individualities when you are willing to compromise. Don’t forget the wedding sparklers! 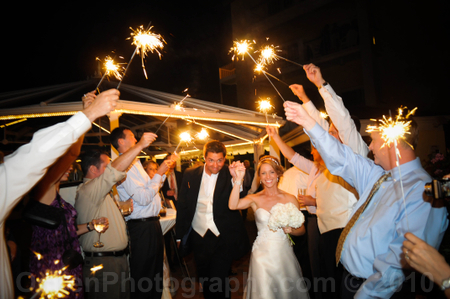 Wedding sparklers are a fantastic way to get your guests involved in the day’s activities. We love them because they’re fun and beautiful additions to add to your celebration’s overall ambiance. You can search our selection of sparklers for sale online and find everything you’ll need to set up a cute sparkle station for your guests. With sparklers, you can create a stunning backdrop for photos and even use them in in long-exposure shots to write messages to your partner. You won’t regret having sparklers at your wedding!